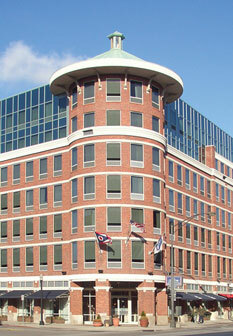 Midwest UX 2011 will take place in the American Electric Power building, situated in downtown Columbus Ohio. Columbus has some great hotels from charming to posh at a range of prices and amenities. We have negotiated a special rate of $129 per night (taxes apply) with the Residence Inn Columbus Downtown for a studio suite. Reservations can be booked at (800) 331-3131 with the special rate if attendee identifies themselves as a member of "Midwest UX Conference" block before March 18, 2011. Mention "Midwest UX" when booking before March 18, 2011. Group Rate includes Full Hot Breakfast. Valet parking is $20/day with unlimited in and out access. Online room reservations are now just a click away with ResLink! The links below will redirect to the hotel's home page with the negotiated rate code already entered in the appropriate field. 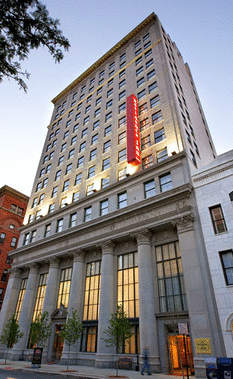 The Residence Inn Columbus Downtown hotel is a contemporary all-suite hotel situated in the exquisitely renovated Historic Buckeye Building. This high-rise hotel in Downtown Columbus will impress you from the moment you arrive with the lobby's soaring 40-foot ceiling entrance. Specializing in extended-stays, our Columbus Ohio hotel features spacious suites with fully equipped kitchens, living and work areas, luxury bedding and FREE Wired & Wireless High Speed Internet. Begin each day with a delicious complimentary hot breakfast buffet. In the heart of Columbus' Business District, you'll find exciting entertainment options like COSI, Arena District, German Village, Columbus Convention Center and the Palace & Ohio Theatres. Short North Gallery District and The Ohio State University are just a short drive away. Attend a play in the nearby Theatre District , walk to the exciting Arena District, or wander through German Village; our downtown Columbus Ohio hotel near the Capitol and OSU is the perfect starting point to explore all the delights of Discovery City. Dine in at The Plaza , one of the city’s finest eateries, or have a casual meal at Darby’s. Host important business meetings and special events in our 16,500 square feet of flexible function space. It’s easy to keep up with your fitness routine too; our 24 hour StayFitTM gym has everything you need. Whether your visit is for business or leisure, Hyatt on Capitol Square is the ideal choice when you want to relax, refresh and recharge. A perfectly situated Downtown Columbus hotel, the Courtyard by Marriott offers superb service in an energetic, urban setting. Start your day off right in our Courtyard Café, serving a hot buffet breakfast for a nominal fee. Relax in our Indoor pool & whirlpool or stay fit in our Fitness Center. Experience the comfort of the Courtyard by Marriott bedding and enjoy 32 flat screen LCD TVs in every guest room. Valet or selfparking is available for a fee. 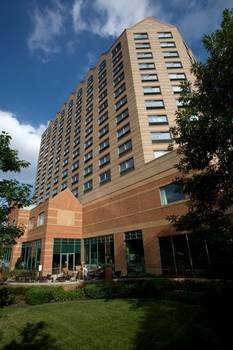 One of the best locations among Columbus Ohio hotels, the Courtyard by Marriott is near the Columbus Convention Center, Arena District, Palace and Ohio Theatres, Veterans Memorial, COSI, German Village, the Short North Arts District, Lifestyle Pavilion and The Ohio State University. Area companies include Nationwide Insurance, AEP, Columbia Gas, Abbott and the State of Ohio Government Offices. Excellent dining, shopping and entertainment options are just steps away at the Courtyard by Marriott Columbus Downtown hotel! 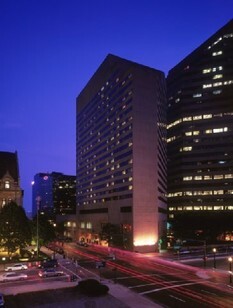 Bustling Columbus, Ohio is the place to be for a day of meetings and a night of fun. This Arena District hotel is near event venues, restaurants, The Ohio State University and Greater Columbus Convention Center. It is also a convenient walk to the Midwest UX conference center at the AEP Building. The Crowne Plaza® Hotel Columbus - Downtown location is perfect for exploring downtown on available rental bikes or attending concerts and sporting event at Ohio State, Nationwide Arena, Huntington Ballpark and The LC Pavilion. You can visit boutiques and restaurants in Short North, spend an afternoon at a park or tour German village, all of which are near this hotel in downtown Columbus. Make reservations today to enjoy all of our perks, including an indoor lap pool, 24-hour Fitness Center, Crowne Sleep Advantage® Program and on-site eateries, Max & Erma's and the Boulevard Bar & Cafe. Fresh from a dramatic $16 million renovation, this stylish Columbus hotel is located near Nationwide Arena, COSI, and the Convention Center, as well as popular museums, theaters and attractions. 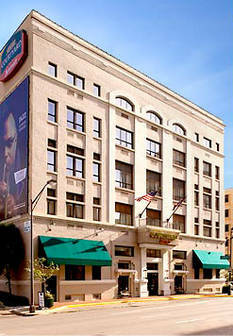 Luxurious rooms with upscale amenities welcome guests at this convenient hotel in downtown Columbus, Ohio. Enjoy hotel dining at Latitude 41, serving fresh, natural American cuisine, or a signature cocktail in Bar 41's vibrant atmosphere. A seasonal rooftop pool showcasing stunning views of downtown is unlike any other Columbus hotel. Additionally, stylishly renovated and innovative indoor and outdoor event facilities provide the perfect backdrop for business meetings and social gatherings. A masterpiece of design, dazzling with contemporary flair and colored with local flavor, this hotel in downtown Columbus, Ohio represents the spirit of the state's capital city in the heart of it all. 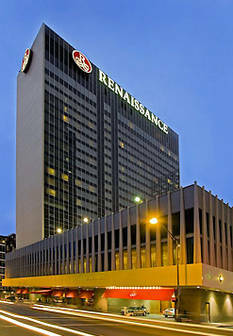 Experience the joy of discovery at the Renaissance Columbus Downtown Hotel. There are so many reasons to visit the Hampton Inn & Suites® hotel in Columbus-Downtown, such as access to famous Columbus breweries, the hopping historic Short North district, famous North Market, and remarkable one-of-a-kind restaurants. This hotel is within walking distance to several hotspots as well as the Midwest UX conference center at the AEP Building. The city of Columbus commands a huge assortment of incredible activities for guests of our hotel in Columbus. So come see all that Ohio's capital has in store for you by staying at the Hampton Inn & Suites hotel in Columbus-Downtown. You'll find taxis available on demand (no reservation required) in the ground transportation area of the terminal on a 24-hour basis. The downtown shuttle from Port Columbus can be of great service. It doesn't matter if you call ahead or just walk right up, with shuttles operating every 20 minutes you can be in the heart of the city in no time.